Our priority at TLC Bounce are the little ones in your life. We cater to keeping the kids busy and entertained during any event you are having. This post is all about having a party in the hot summer months and how to stay cool during these events. Step One: Rent a Bounce House. Every kid loses their mind when they see a bounce house. We guarantee that you will have a problem getting them out of the inflatable when the party is over. We have three different inflatable fun options starting with the standard bounce house and moving up to the obstacle course for the more ambitious kiddos. Each rental includes at least one blower, stakes and an extension cord. We offer moon bounces in a variety of price ranges to fit your needs. 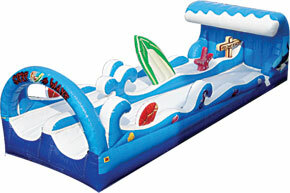 We also offer water slides to really step it up a notch. Step Two: Get a snow cone machine. Don’t know where to get a snow cone machine? That’s why we’re here. Rent one! Need syrup? We’ve got that, too. Cherry, Grape and Orange. Let the birthday boy or girl decide.